Thank you for the prompt shipment of the perfect earrings. My Grandchild took a selfie with the earrings on and they looked perfect! This is one of my favorite pairs of earrings. 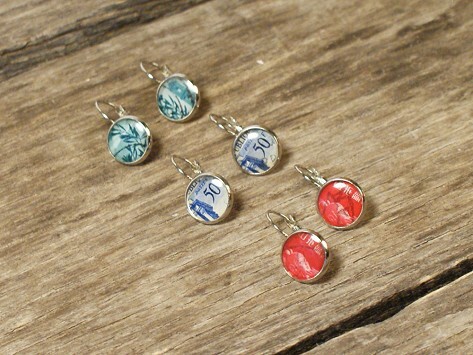 I love the idea of using old postage stamps to create new jewelry. They are beautiful! Very impressed with purchase. Love my earrings. Quick delivery, packaged well and in perfect condition. I receive compliments from others whenever I wear them. Great price too. Wore them once and got many compliments. I love them--for the price they are wonderful! I am wearing the set this Memorial Day weekend. Love them. Exactly as described. Very proud to wear them! These are very pretty. They are just the right size to wear everyday. And they are American made. Just lovely! 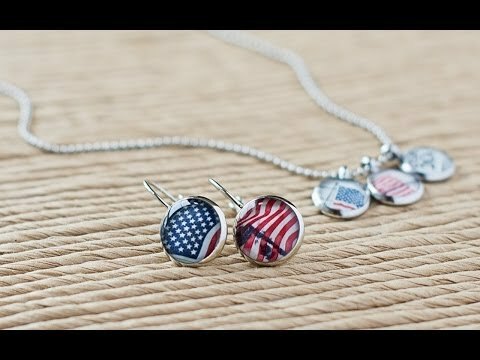 I purchased the American flag set. Perfect for my job in Veteran's home and anytime! Good quality and workmanship!